Before you care for a burn you must first identify the type of burn you are treating. Burns are classified according to the amount of tissue they affect and how deep they are. First Degree Burns are the least severe. They are red and very sensitive to touch, and skin will appear blanched when light pressure is applied. First-degree burns involve minimal tissue damage and they involve the epidermis (skin surface). These burns affect the outer-layer of skin causing pain, redness and swelling. Sunburn is a good example of a first-degree burn. 1. If the skin is not broken, run cool water over the burned area or soak it in a cool water (NOT ICE WATER) bath. Keep the area in the bath for five minutes. If the burn occurred in a cold environment, DO NOT apply water. A clean, cold, wet towel will also help reduce pain. 2. Burns can be extremely painful, reassure the victim and keep them calm. 3. After flushing or soaking the burn for several minutes, cover the burn with a sterile non-adhesive bandage or clean cloth. 4. Protect the burn from friction and pressure. 5. Over-the-counter pain medications may be used to help relieve pain; they may also help reduce inflammation and swelling. 6. Minor burns will usually heal without further treatment. Second Degree Burns are deeper than first degree burns. They affect both the outer-layer (epidermis) and the under lying layer of skin (dermis). Second degree burns are distinguished by the blistery, red blotchy marks they leave on the skin. Blisters form in these burns because the burn penetrates deeper into the layers of skin, releasing body fluids that erupt and cause blisters on the surface. Sometimes the burned area will swell or ooze, and it is painful. 1. Submerge the burned area in cold water (as cold as possible). If the burn occurred on the chest or back, apply a burn wrap or pour cold water from a bucket or a hose directly onto the burn. 2. Keep the cold water on the burn until medical help arrives. If the burns are minor, keep them in cold water for at least five minutes. 3. If the burns are extensive, you can apply a cool, wet cloth to the affected area, but only if the dressing is wrapped in plastic. Cloth tends to adhere to burns, and it can worsen the pain if a physician has to pull it off to treat the burn. 4. If the burns are minor, you can treat them in the same way you’d treat first-degree ones. You won’t need medical help. Simply pat the area dry and place a loose sterile cloth over it. Third Degree Burns are the deepest and most severe. Skin with a third-degree burn may appear white or black and leathery on the surface. This severe burn destroys the nerves and blood vessels in the skin. Because the nerves are damaged, there is little or no pain at first. Healing from third-degree burns is very slow due the skin tissue and structures being destroyed. Third-degree burns usually result in extensive scarring. Third Degree Burns require emergency medical treatment. 1. Call for medical attention if access is immediately available. 2. DO NOT remove burnt clothing (unless it comes off easily), but do ensure that the victim is not in contact with burning or smoldering materials. 3. Make sure the victim is breathing. If breathing has stopped or the victim’s airway is blocked then open the airway and if necessary begin CPR. 4. If the victim is breathing, cover the burn with a cool moist sterile bandage or clean cloth. DO NOT use a blanket or towel; a sheet is best for large burns. DO NOT apply any ointments and avoid breaking blisters. 5. If fingers or toes have been burned, separate them with dry sterile, non-adhesive dressings. 6. Elevate the burned area and protect it from pressure or friction. 7. Take steps to prevent shock. Lay the victim flat elevate the feet about 12 inches, and cover the victim with a coat or blanket. DO NOT place the victim in the shock position if a head, neck, back, or leg injury is suspected or if it makes the victim uncomfortable. 8. Continue to monitor the victim’s vital signs (breathing, pulse, blood pressure). As with all safety issues, it is best to practice preventative measures to stop injuries from occurring in the first place. To avoid burns, be sure to suit up with the proper protective gear, from fire-resistant work gloves to fire-proof apparel. Not all work gloves are created equal. Some are designed to handle the high heat welders face, while others are crafted to be worn with a full-body hazmat suit. Chemical-resistant gloves are made with different kinds of rubber: natural, butyl, neoprene, nitrile and fluorocarbon (viton); or various kinds of plastic: polyvinyl chloride (PVC), polyvinyl alcohol and polyethylene. These materials can be blended or laminated for better performance. As a general rule, the thicker the glove material, the greater the chemical resistance but thick gloves may impair grip and dexterity, having a negative impact on safety. Natural Rubber Latex Gloves are comfortable to wear, which makes them a popular general-purpose glove. They feature outstanding tensile strength, elasticity and temperature resistance. In addition to resisting abrasions caused by grinding and polishing, these gloves protect workers’ hands from most water solutions of acids, alkalis, salts and ketones. Latex gloves have caused allergic reactions in some individuals and may not be appropriate for all employees. Hypoallergenic gloves, glove liners and powderless gloves are possible alternatives for workers who are allergic to latex gloves. Nitrile Gloves are made of a copolymer and provide protection from chlorinated solvents such as trichloroethylene and perchloroethylene. Although intended for jobs requiring dexterity and sensitivity, nitrile gloves stand up to heavy use even after prolonged exposure to substances that cause other gloves to deteriorate. They offer protection when working with oils, greases, acids, caustics and alcohols but are generally not recommended for use with strong oxidizing agents, aromatic solvents, ketones and acetates. Neoprene (polychloroprene) Gloves are made of synthetic rubber and offer good pliability, finger dexterity, high density and tear resistance. 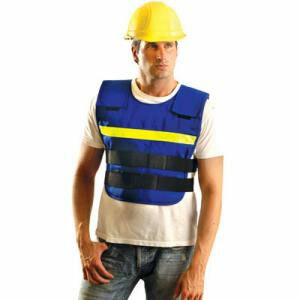 They protect against hydraulic fluids, gasoline, alcohols, organic acids and alkalis. They generally have chemical and wear resistance properties superior to those made of natural rubber. Polyvinyl Chloride (PVC) Gloves provide protection against many acids, caustics, bases and alcohols. PVC is not recommenced for ketones or many other types of solvents. It generally offers good abrasion and cut resistance, but some gloves styles are susceptible to cuts. Polyethylene Gloves offer economical protection from mild chemicals, oils, fats, punctures and abrasions. Component material of polyethylene gloves comply with FDA regulations for food contact. Butyl Gloves are made of a synthetic rubber and protect against a wide variety of chemicals, such as peroxide, rocket fuels, highly corrosive acids (nitric acid, sulfuric acid, hydrofluoric acid and red-fuming nitric acid), strong bases, alcohols, aldehydes, ketones, esters and nitrocompounds. Butyl gloves also resist oxidation, ozone corrosion and abrasion, and remain flexible at low temperatures. Butyl rubber does not perform well with aliphatic and aromatic hydrocarbons and halogenated solvents. The following table from the U.S. Department of Energy (Occupational Safety and Health Technical Reference Manual) rates various gloves as being protective against specific chemicals and will help you select the most appropriate gloves to protect your employees. Click here to view Chemical Resistance Chart. Bifocal Safety Glasses are great for those needing the protection of safety glasses combined with the convenience of a bifocal. 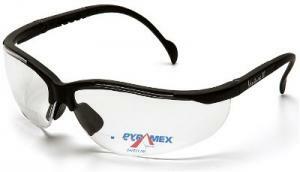 These safety glasses come either shaded, for outdoor use or clear for indoor applications. Thanks to a sleek, yet protective design, you get substantial shielding that leaves room for other safety gear, from ear plugs to a face mask. There is an indoor/outdoor lens that is perfect for individuals working in both environments. “In the event of an influenza pandemic, employers will play a key role in protecting employees’ health and safety as well as in limiting the impact on the economy and society. Employers will likely experience employee absences, changes in patterns of commerce and interrupted supply and delivery schedules. To further preparedness efforts, the Department of Labor (DOL) proposes to publish this information on stockpiling respirators and facemasks in occupational settings as an appendix to the DOL and the Department of Health and Human Services (HHS) jointly issued Guidance on Preparing Workplaces for an Influenza Pandemic (February 2007). This proposed guidance is designed to encourage employers in the private and public sectors to purchase and stockpile facemasks and respirators in advance of an influenza pandemic, because manufacturing capacity at the time of an outbreak would not meet the expected demand for respiratory protection devices during the pandemic. Through advanced planning and stockpiling, employers will be able to better protect their employees as well as lessen the impact of a pandemic on their business, society, and the economy. The Peltor Kids Earmuffs are a great product produced by Peltor, a recognized leader in manufacturing headsets and earmuffs. These earmuffs offer a NRR (noise reduction rating) of 22 db, feature an adjustable headband and come in either Neon Pink or Blue. 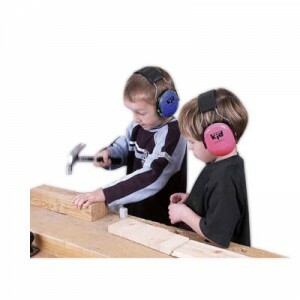 They are ANSI approved hearing protection and fit children up to age 7. Providing fuller coverage than ear plugs, they are lightweight, offer plenty of room for the ears inside the cups and feature foam-filled cushions for comfort. Great for concerts, races, or out in the workshop. Work environments where employees are at risk of heat stress include but are not limited to: steam tunnels, smelters, mining sites, chemical plants, food canneries, laundries, commercial kitchens, confectioneries, bakeries,electrical utilities, rubber products factories, glass products facilities, brick-firing and ceramic plants, nonferrous foundries, iron and steel foundries. Employees working in high air temperatures, around radiant heat sources, or in high humidity while performing strenuous physical activities are at great risk for inducing Heat Exhaustion, Heat Cramps or even Heat Stroke (a medical emergency). Heat Exhaustion. The signs and symptoms of heat exhaustion are headache, vertigo, thirst, nausea, weakness and giddiness. This condition responds readily to prompt treatment. Heat exhaustion should not be taken lightly for several reasons. One is that fainting associated with heat exhaustion can be dangerous if the victim happens to be operating heavy equipment or other dangerous machinery. Also, the victim could be injured when he or she faints. Heat Exhaustion, if ignored can lead to Heat Stroke, a medical emergency which puts the victims life in danger. Heat Cramps are often caused by performing strenuous physical labor in a hot environment. These cramps have been attributed to an electrolyte imbalance caused by sweating. It is important to understand that cramps can be caused by both too much or too little salt in the bodies bloodstream. Cramps appear to be caused by the lack of water replenishment. Excess salt can build up within the body if the water lost through sweating is not replaced on a regular basis. Thirst cannot be relied on as a guide to the need for water and electrolyte replacement, instead fluids must be taken in every 15 to 20 minutes in hot environments. Heat Stroke occurs when the body is no longer able to properly regulate body temperature. This condition is caused by a combination of highly variable factors, and its occurrence is difficult to predict. Heat stroke is definitely a medical emergency. The signs and symptoms of heat stroke are confusion, irrational behavior, convulsions, loss of consciousness, lack of sweating, hot, dry skin and an abnormally high body temperature. If body temperature is too high, death can occur. Enviro Safety Products offers many tools to combat the ill effects of working in hot environments. Some of which are Cooling Vests, MiraCool Cooling Bandanas, Hard Hat Cooling Products, Sqwincher Hydration Drinks, and Electrolyte Replacement Tablets. One of our best-selling work gloves, Ninja Flex Latex Coated Gloves are great for many different applications. 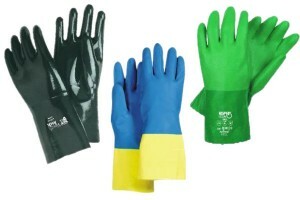 Use these gloves for agriculture, durable goods assembly, recycling, box handling and yard work. 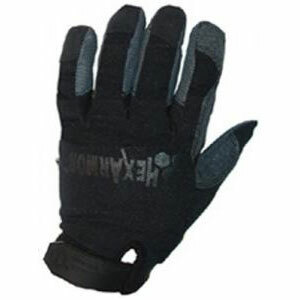 An economical all-purpose glove that offers amazing dexterity and comfort. The Ninja Flex Latex Coated Gloves feature a nylon shell to reduce heat buildup keeping your hands dry and comfortable. The latex rubber coated palm and fingers offer an excellent grip while maintaining superb flexibility and elasticity. The HexArmor NSR Gloves combine the comfort and dexterity of a mechanics style glove with significant needlestick protection. HexArmor gloves work great for baggage search and correctional facility pat-downs and searches. In addition to puncture and sharps resistance, the cut resistance provided in these gloves is very high, Level 5 on the ISEA guideline. The NSR provides 3 layers of protection on the palm, fingers, and forchettes. If Hexarmor’s hand protection doesn’t sound like the gear for your job, check out our entire selection of work gloves featuring specialized designs for any assignment you may face. The Peltor PowerCom Plus II 2-Way communication headset is ideal for communicating in noisy environments. Unlike ear plugs or ear muffs, Peltor’s headset not only limits external noises but also amplifies the conversations being transmitted through its radio. This headset has everything needed for its operation contained within the headset. The 2-way radio headset DOES NOT require a belt radio, wires, or base radio stations. 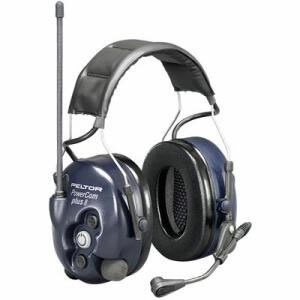 The Peltor Headset also features a NRR of 25db and is compatible with existing in-plant UHF 2-way radio systems. The new ClearVisor Powered Air Purifying Respirator System combines respiratory, eye and face protection in one convenient product. Ideally suited for the woodworking and metal working professional, or for anyone working in a dusty environment, the ClearVisor PAPR allows the user to work comfortably and safely. The Adflo’s motor blower provides constant flow, HEPA filtered air powered by a rechargeable NiMH battery for up to 8 hours of run time. 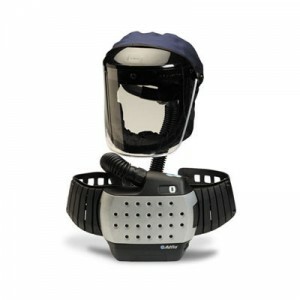 Loose fitting visor face seal accommodates workers with facial hair and eliminates the need for respirator fit testing. It doesn’t take long to realize just how comfortable work can be. Comfort can help lead to more work, less breaks.